Pinot Noir by Bird In Hand of Adelaide Hills. Clean, vibrant strawberry flavours are enhanced by the very fine, persistent bead. Enthused by a consuming desire to make great wine, Andrew Nugent honed his craft as viticulturalist and winemaker amongst the vines of McLaren Vale before returning to the Adelaide Hills, where he established his very own wineworks at Woodside. 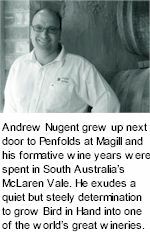 Andrew Nugent established vineyards and olive groves on his property along Bird in Hand Road at Woodside in the Adelaide Hills. To be enjoyed whilst young and gently chilled, the perfect aperitif or celebratory drink.